The fields of fine art restoration and art conservation share similar goals, but they involve different approaches and methods. Art restorers clean the artwork to try to bring it back to its original condition as the artist had intended, whereas art conservators research, document and try to prevent further damage to the artwork. Although the two jobs have different aims, there is some overlap in the technical expertise required to restore and conserve artworks. There is a wide range of jobs for both art restorers and art conservators. For art restorers, jobs include restoring murals and mosaics at onsite locations, repairing broken ceramics, and cleaning paintings in galleries or museums. Art conservators may also be part of a museum's full-time staff, in charge of the museum's collection of artworks, or they may work independently. In a conservation department, a conservator uses high-tech scientific tools such as Raman spectroscopy and an X-ray fluorescence spectrometer. Traditionally, in the past, restorers apprenticed with masters to learn the tools of the trade. Skills and techniques may have also been passed down through generations of a family of restorers. 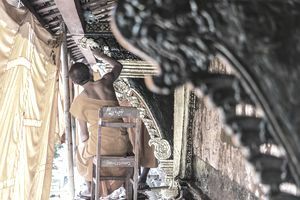 These days, however, with the latest high technology, many restorers and conservators attend university or institutional conservation programs to learn such cutting-edge techniques and to even learn some ancient skills. If you are interested in becoming a fine art restorer or conservator, check out these art conservation programs from around the world. Of particular note is the University of Delaware Art Conservation Department, which has offered undergraduate, master's, and doctoral degrees in art conservation since the 1970s. Students get to work in a museum that has 25 studios in which to learn the craft and technology.